As my regular readers know, I always give a creative money gift to my 16-year old nephew, Timothy. I didn't have an idea yet, as I was browsing through his Amazon wish list. I noticed he had this pair of pruning shears on there. Inspiration struck! 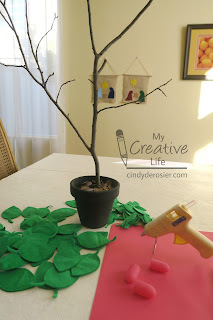 I would buy him the shears and create some sort of tree that had money he could harvest! 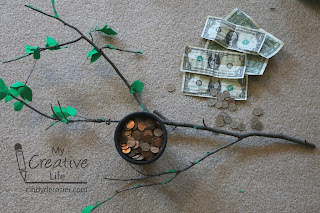 I started by painting a clay pot black, pruning an interesting branch off a tree in the backyard, and testing to see if coins would support it entirely on their own. Fortunately, the answer was yes. Steve puts all his pocket change into a big bowl each day (which has come in handy more than once while working on Timothy's gifts), so Trevor helped me sort out the dirtiest of the pennies to mimic the look of soil. We didn't count them, but it took around 350 pennies to fill the pot and support the branch. 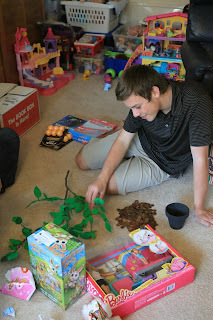 The next step was figuring out how to hide the rest of the money in the leaves, as $3.50 total wasn't going to cut it. 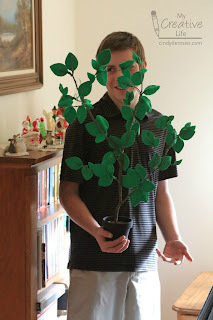 I found a green flannel fabric, but couldn't fathom cutting out leaves by hand. 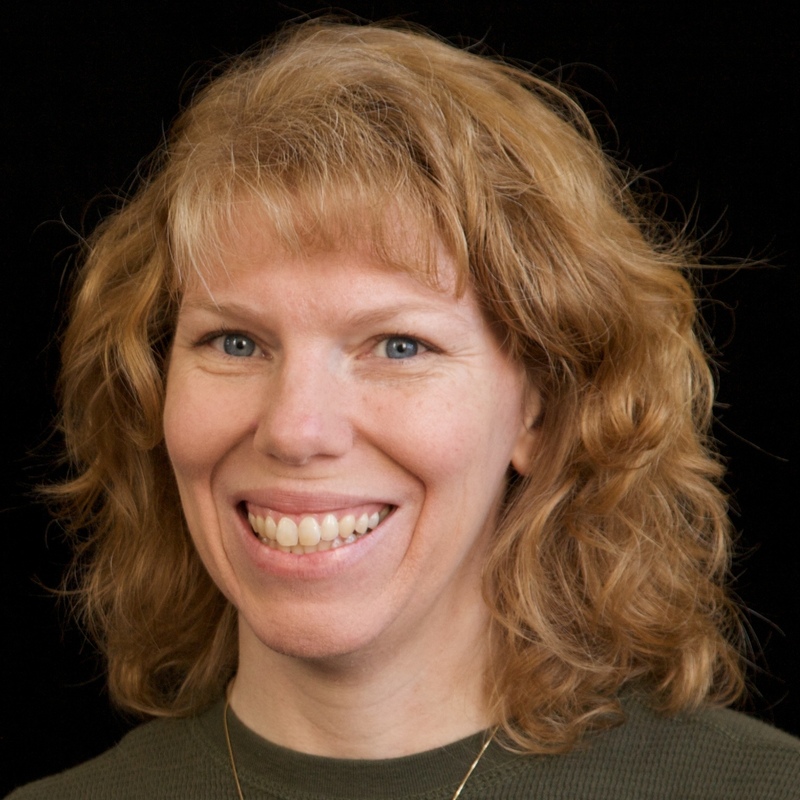 My awesome friend Sheena to the rescue! She brought her Big Shot and her leaf die to my house and kept me company while I cut out 200+ leaves. 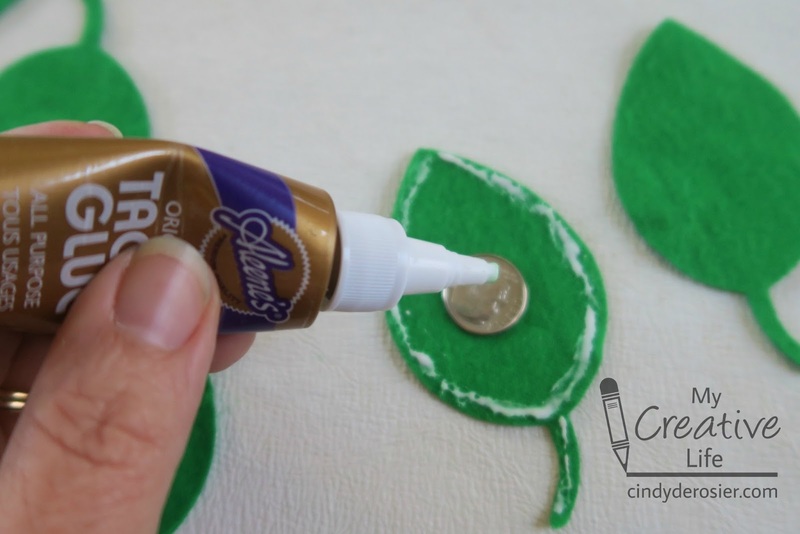 I folded up a dollar bill as tightly as I could, added tacky glue to the perimeter of one leaf, pressed it to a second leaf, and crossed my fingers that it would work. 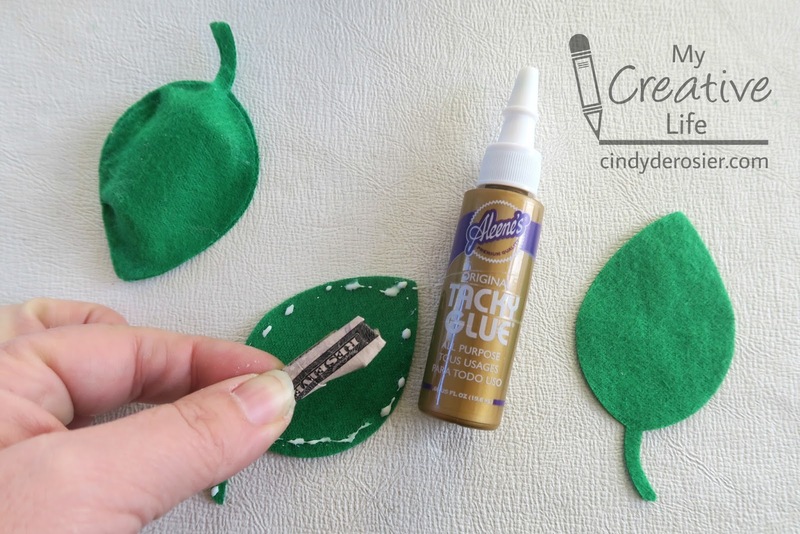 (Not literally, as I was pinching the leaves together with both hands to give the glue a chance to grab hold.) The bill unfolded slightly when I let go, but the glue held and the leaf took on some nice dimension. Here you can see a finished leaf with money inside (top left) and the next leaf in progress. I wanted to include coins in the leaves as well, but quarters were too large and heavy. Dimes worked out beautifully. When I had assembled all 100+ leaves, it was time to attach them to the branch to make my tree. Plaid's Glue Gun Helpers (affiliate link) were so helpful! I highly recommend them. No burned fingers! Here's the halfway point. 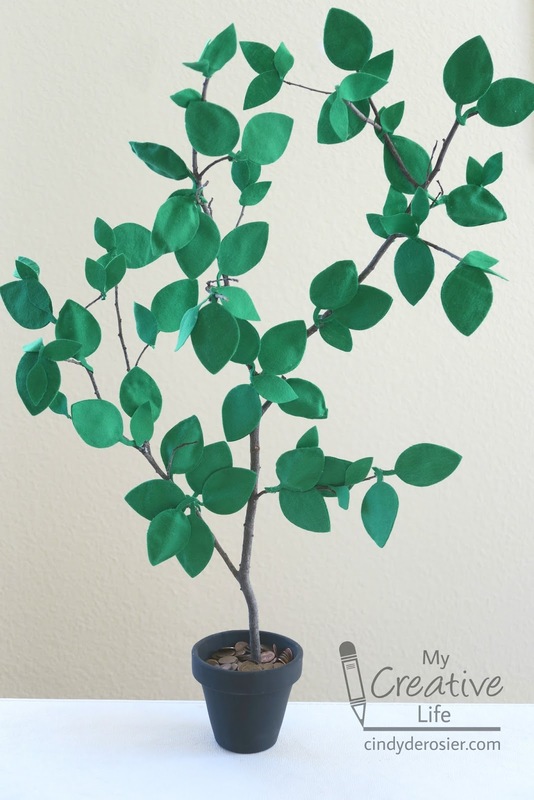 I tried to place the leaves so they looked as natural as possible. 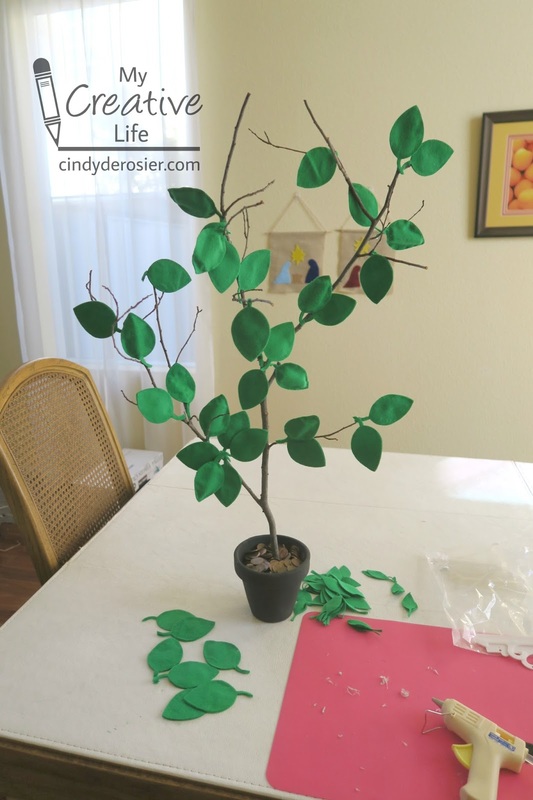 After attaching the final leaf, I picked off the glue gun strings and stepped back to admire my work. Then I interrupted Steve to make him come and admire my work, too. I was so pleased with my completed money tree, but I had given no thought to how I was going to transport it to Grandma and Grandpa's house. So I made Steve, Engineer Extraordinaire, figure it out. 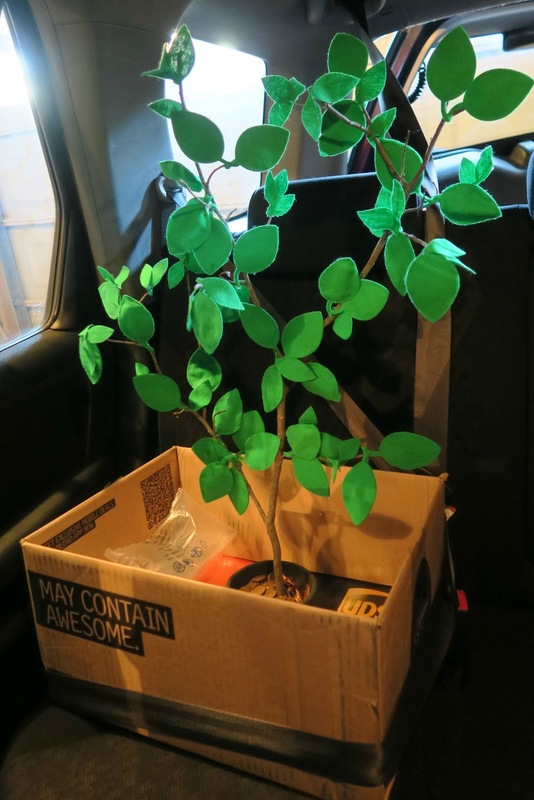 I love that the box says May Contain Awesome and that my tree is wearing a seatbelt. The other thing I hadn't considered was how to wrap it. 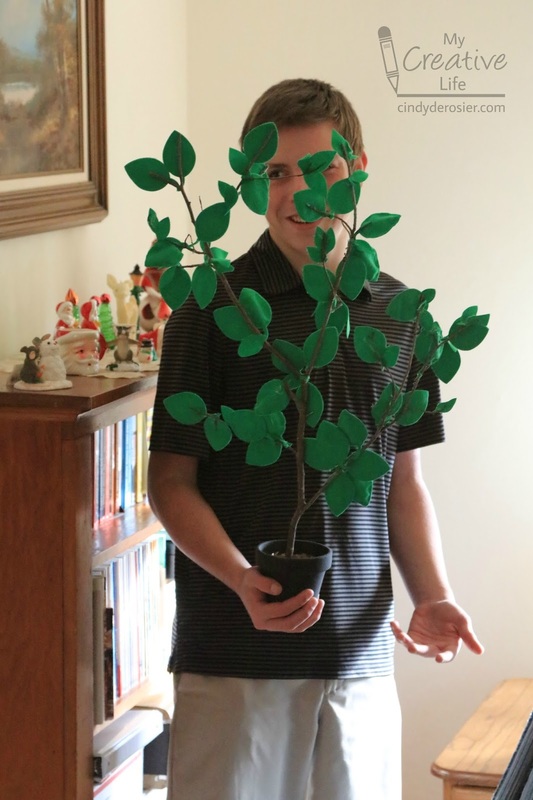 Steve suggested just putting it under the Christmas tree without saying anything about it and seeing if Timothy even noticed. I put the Money Tree on an end table. 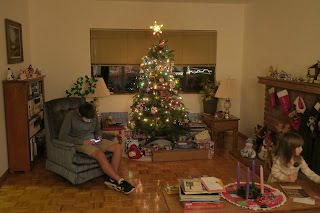 I cracked up when Timothy came into the living room and sat in the chair in front of the end table to check his phone, never noticing his unwrapped gift right behind his head. 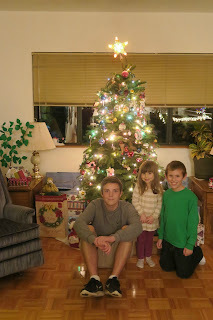 The three cousins in the foreground on Christmas Eve. 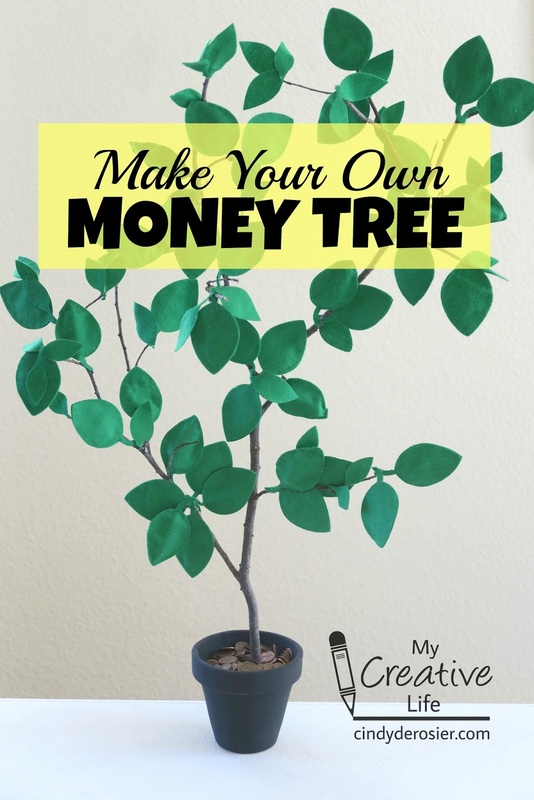 Money Tree in the background, in plain sight. On Christmas morning, the cousins passed out all the gifts... except one. I told Timothy that he had left his gift behind. 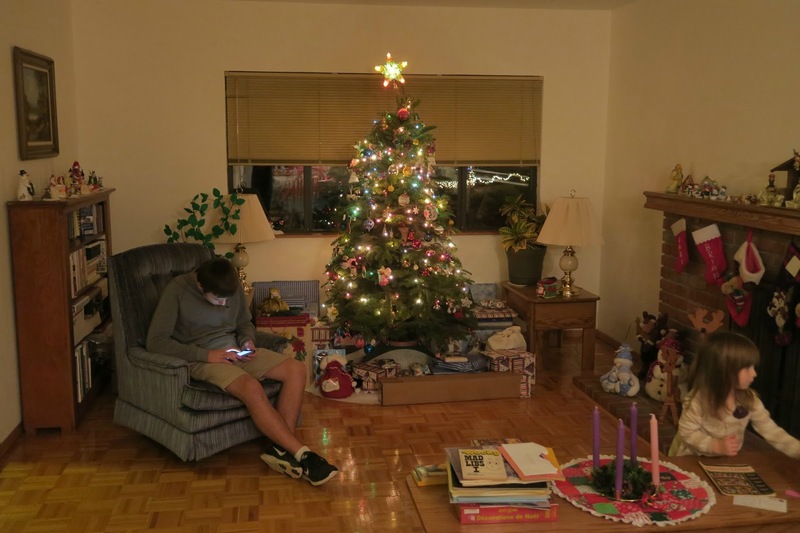 He claimed that he'd seen it, but figured it was just a new decoration that Grandma had bought. 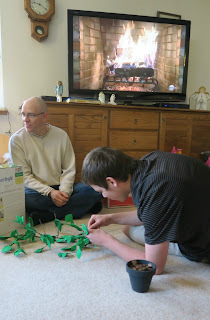 I like this picture because it shows off the Yule Log on the TV and because it's taking Timothy so long to open his gift that everyone else has cleaned up their presents around him. And here's the stripped tree. 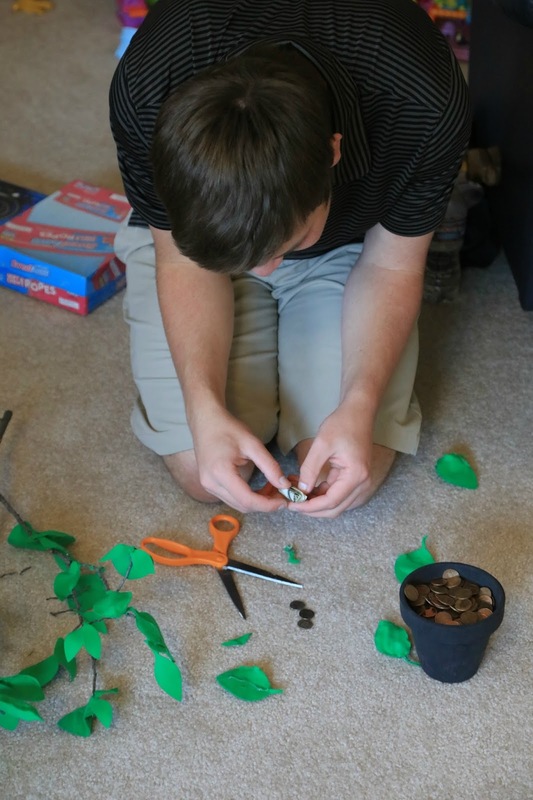 Interestingly, Timothy pocketed the larger bills before throwing away the cut up felt bits, but left the ones, dimes and pennies on the floor. All in all, highly successful. Now I have 10 months before I need to think up another clever way to give money as a gift! This turned out so good (not that I had any doubts). I just love your creativity. 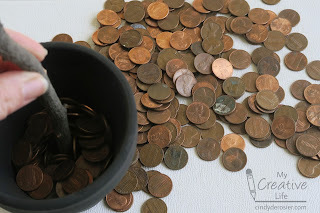 That is a great way to hide money but time consuming for someone w/ zero patience like me, LOL! My husband made a joke gift to give our son money for Christmas this year...a box of "soiled underwear" and "poop"! It was actually pretty gross and realistic looking; my son gagged for real and dropped the box! We had to convince him to dig through it in order to find the money; $200! It was one of those "priceless" moments, LOL! Wow. 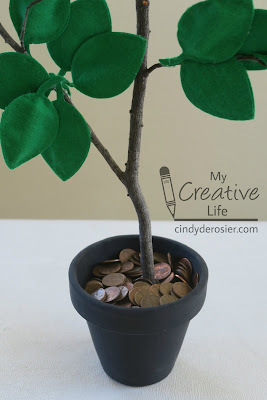 My level of dedication to giving Timothy creative money gifts falls significantly short of poop! Wow!! That is amazing! I loveeeeeeeee that idea!!!!!!!!!!!! Good Morning, Cindy! You are so creative!!!! 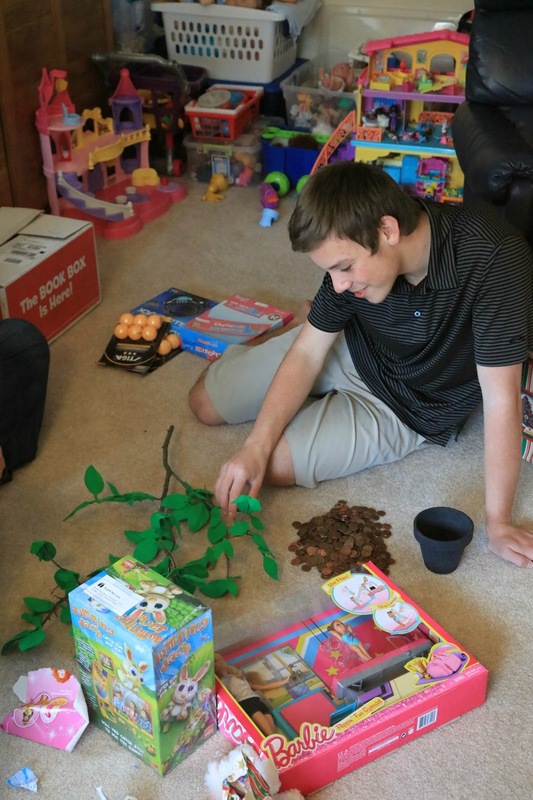 What a wonderful way to give money as a gift instead of just putting bills in an envelope! I love this idea so much. Thanks for sharing this with all of us. And Happy New Year to you and your family, my friend!